Vice President for Research Gary Ostrander (left) and renowned glass artist Kenneth Von Roenn (second from right) unveil “Convergence” at the AME Building. Florida State University unveiled a sparkling new glass sculpture on Friday that will decorate the Aero-Propulsion, Mechatronics and Energy Building located at Innovation Park. The energy and spark that goes into creating will hopefully touch and inspire not only visitors to the building, but also researchers involved in high level scientific endeavors who are spending 60-70 hours per week here. Art is just the greatest thing you can have in a building that is functionally sterile. The work, titled “Convergence,” is a suspended sculpture, composed of dichroic acrylic with an aluminum central spine and stainless steel cables. Dichroic acrylic will add a sense of movement and color to the sculpture because it casts different colors in different directions depending on the light. Renowned glass artist Kenneth Von Roenn, director of the Florida State University Master Craftsman Studio, said because the glass reflects light and movement, it will look different to everyone who encounters it and will change as they walk through the room. “Each viewer thus becomes involved in the work,” said Kenneth Von Roenn. The three dichroic rings represent the three components of study at the facility: aero-propulsion, mechatronics and energy. But the piece over all is about collaboration, which is key to the work done in the AME building. 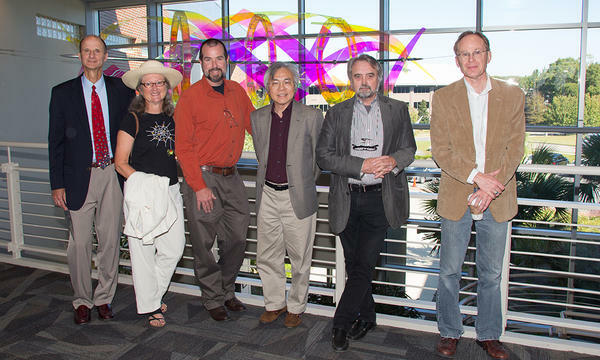 The project, funded by FSU Office of Research, is part of a larger effort to connect the university’s artistic endeavors with science and engineering by showcasing work by Florida State University artists in all areas of the campus, even buildings that are inherently sterile such as a research facility. The AME Building serves as a central point for the southwest campus by linking all of the neighboring research centers through cross-disciplinary research, educational and outreach activities. It is also home to the Florida Center for Advanced Aero-Propulsion.